This initial phase focuses on the exploration of the problem at hand, the objectives, and the organisation of the decision process, with consideration of organisational and institutional issues, the legislative context, and potential sources of conflicts. The planning and management of the process is one of the most important factors of success in decision making. It is crucial that the Task Force Group (TFG) at this stage identifies possible constraints (e.g. data availability), raises interest and commitment of competent administrations, sets up communication activities, defines reasonable expectations, and identifies suitable methods and tools (e.g. 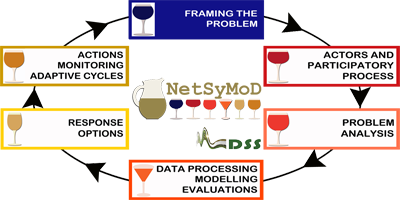 DSS and models) that may be useful for the given purposes. The clearest understanding of the legislative and institutional contexts is of greatest relevance here. At the beginning of any decision making activity the group of people in charge of the process (TFG), including key stakeholders supported by the technical staff in charge of the management of the decision process, focuses on the exploration of the problem at hand and the organisation of the process itself. Organisational and institutional issues are considered together with the relevant legislation, and objectives are discussed and clearly stated. The planning and management of the process is one of the most important factors of success in decision making. The TFG should identify possible constraints (e.g. data availability), raise interest and commitment of competent administrations, set up communication activities, define reasonable expectations, and identify suitable methods and tools (e.g. DSS’s) that may be useful for the given purposes. Evident information gaps could be preliminarily identified in the available data, or also in human resources. Other important limitations could come from time and financial resources available for the process. A clear understanding of the gaps and limits is of fundamental importance for an effective design and plan of the process, including the identification of needs for external consultants, ICT tools, etc. 4 - a list of decision criteria and possibly quantitative indicators against which the performance of the possible solutions (alternative options) can be measured.